I have just put the final touches to my latest craft project. 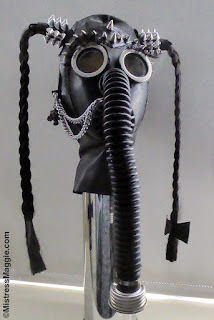 I chose a cute looking Russian kiddies gas mask as a foundation for my design. The position of the rubber hose at centre front is a little unusual in gas masks and a feature that gives my mask a novel character. The first thing I did was attach a latex hood to it and put a zip fastening at the back. 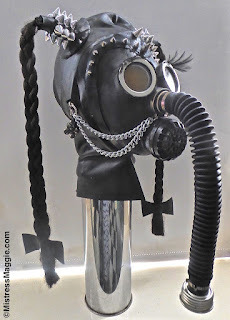 I attempted to give my mask a feminine spin by adding exaggerated lashes and long ribboned braids, before decorating it with archetypal punk elements in shiny silver metal. I am a bit of a magpie when it comes to small metal embellishments and had many types to pick from in my project box. Mistress Maggie wearing her latex steampunk gas mask creation. Nothing beats the allure of rubber breathplay. Luckily I can get away with wearing a gas mask in a small kids size, and not only does my completed steampunk creation look beautiful but it also remains fully functional. 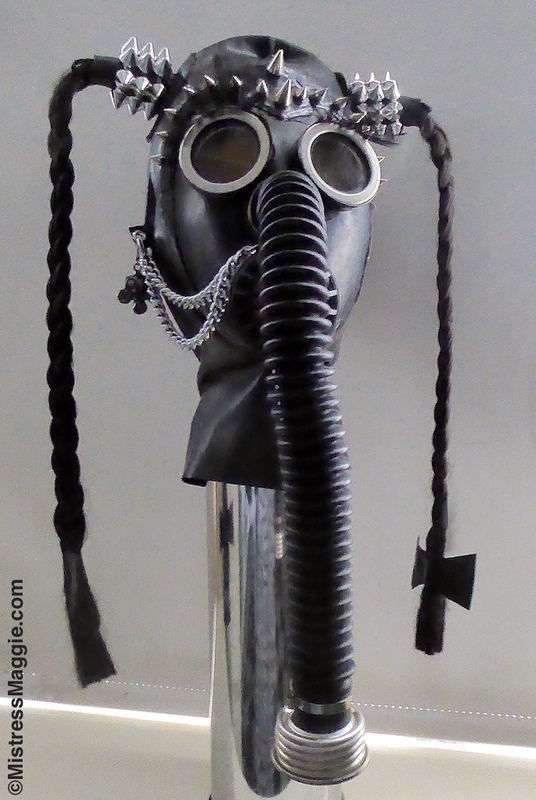 The mask will be on display in my chambers for the next few months, where if you are visiting for a session and fancy a steam or even cyberpunk moment, I will be pleased to model my bizarre gas mask creation for you on request. I would like to give a big thank you to Marco for his kind gift of the red spiky collar seen in the photos here.